At approximately 6:00 a.m. on March 15, 2019, a motorcyclist was killed in a two-vehicle collision that occurred in the City of Carpinteria. The collision, involving a blue BMW R1200RS motorcycle and a green Ford F150 pickup truck occurred at the intersection of Highway 150 and Via Real. The BMW motorcycle was traveling westbound on Highway 150 and the Ford pickup truck was turning from Highway 150 onto Via Real when both vehicles entered the intersection and collided. 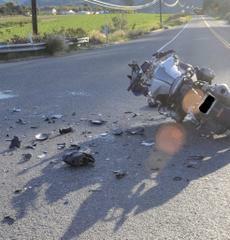 The rider of the BMW motorcycle has been identified as 43-year-old Richard Cramer of Ojai. Following the collision, paramedics performed life-saving measures on Cramer, but he was pronounced deceased at the scene. His next of kin has been notified. The Ford pickup truck was driven by a 47-year-old male resident of Oxnard. He was not injured in the collision and remained at the scene to cooperate with the investigating deputies. The Santa Barbara Sheriff’s Major Accident Response Team is investigating this collision to determine its cause and whether alcohol and/or drugs were a factor. Anyone with information regarding this collision is asked to call Deputy John DeLeon at 805-961-7519, or send him an email at jad3116@sbsheriff.org. To leave an anonymous tip, please call 805-681-4171 or go to http://www.sbsheriff.org/anonymoustips.html. The City of Carpinteria contracts with the Santa Barbara Sheriff’s Office for law enforcement services.